Private Stock Cheddar or Vintage Choice Cheddar? At the Cabot retail store in Quechee, Vermont, Amy Richardson surveys her options, then plunks one of each into her shopping cart. After a brief pause, she scoops up a third bar: Hot Buffalo Wing Cheddar—for her boys. Instagram: @richardsonfamfarmRichardson dairy cows take to the pasture. Amy’s more than a customer here — she’s a farmer from one of the 1,100 family farms in New England and upstate New York who belong to the Cabot Creamery Co-operative. Her cows produce the milk that makes the cheese she’s now buying. That’s how Cabot works. When you buy the cheese, you’re not just supporting the creamery. 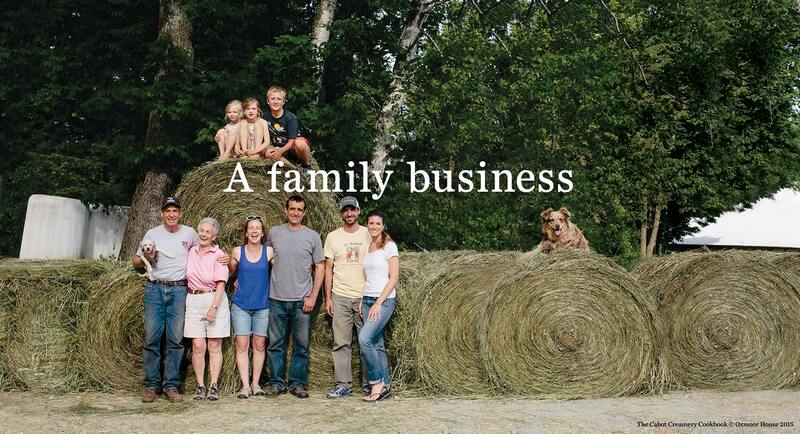 You’re supporting family farmers like Amy Richardson. 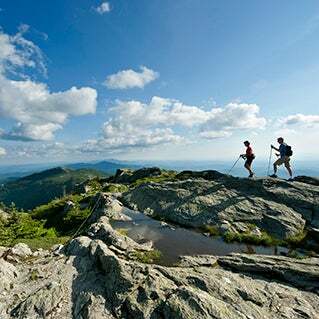 In the charming town of Hartland—right outside the more tourist-centric Quechee—the Richardson Family Farm sits on 500 acres of gloriously green rolling hills and woodlands. The family’s 110 caramel-colored Jersey cows—they’re milking 45 this July—are spread out according to age group. Everywhere you turn, from fenced pasture to historic barn, you’ll see a curious cow looking back at you. Amy, Scott, and the rest of the Richardson clan on their dairy farm in Vermont. Amy’s husband, Scott, along with his brother Reid, are the fourth generation of Richardson sons to operate the farm. Besides milking cows, the farm also runs a maple sugaring operation and a split rail fence manufacturing business. With so much going on and all family members involved, you can still be sure that if you stop by for a visit, someone will be there to greet you. Probably Amy. A springy-haired, straight-shooting, social-media-tooting cowgirl, Amy does a little bit of everything here. In addition to her daily milking duties, she runs the farm’s Instagram handle, @richardsonfamfarm, with 10,400 followers. 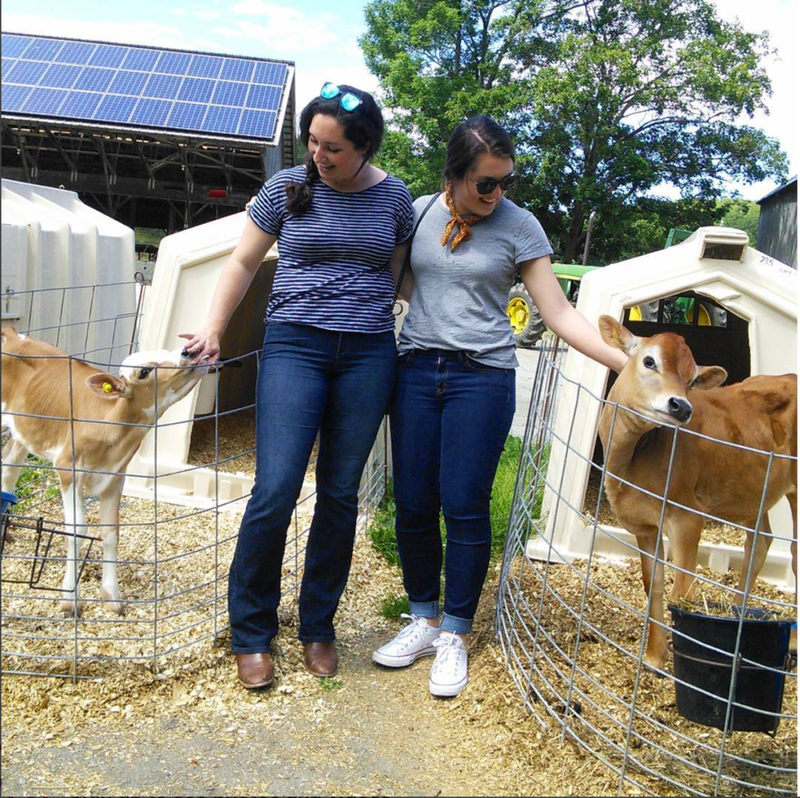 Richardson sees Instagram as a way to connect with consumers and educate them on the realities of dairy farming. “Every little opportunity you can take to share some facts is totally worth it and valuable,” she says. 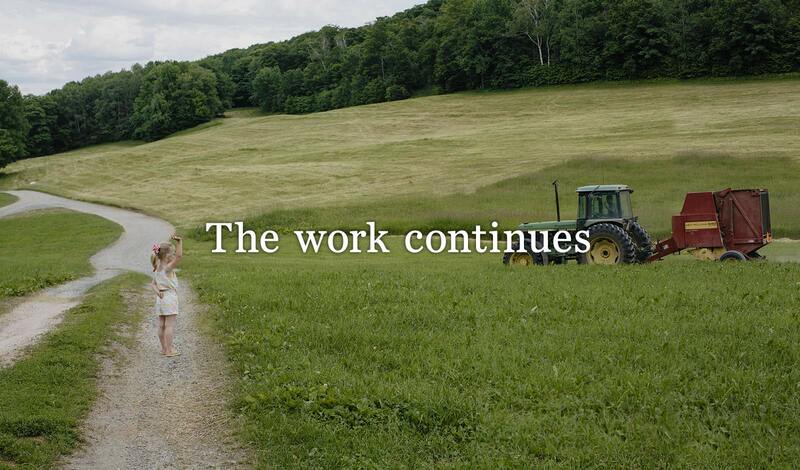 In addition to raising families and caring for their animals, farmers are stewards of the land their farm sits on. Growing crops and caring for the land leads to nourishing feed for their cows. Happy cows produce higher quality milk. Peek into the milking parlor at Richardson Farm and you’ll see a wall of awards, recognizing their farm for its high-quality milk—a point of pride for the family. As Amy explains, Jersey cows as a breed are known to produce milk with higher protein and butterfat components—prime cheesemaking milk. After milking, the Richardson’s cows’ milk is collected in a bulk tank and hauled to one of Cabot’s creameries. Turning that milk into Cabot Cheddar is the next step. Open cheddar tables at Cabot Creamery stir cheese curds. The curds are formed into blocks and naturally aged. 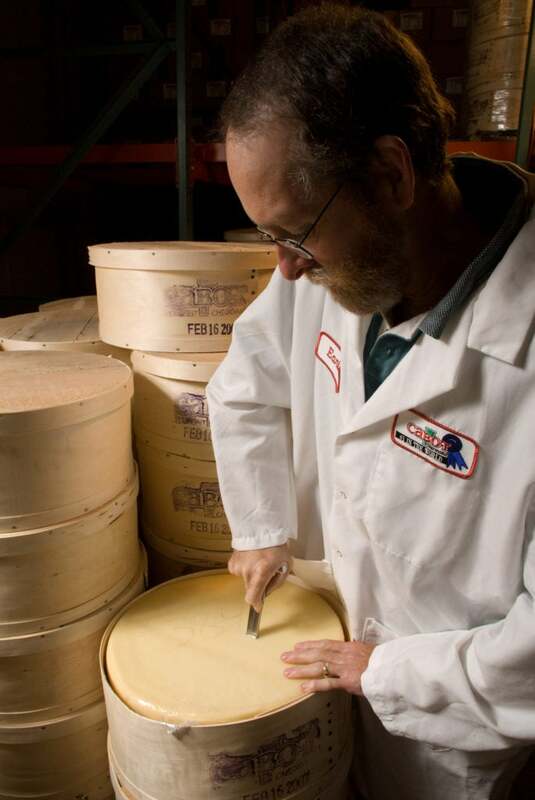 A Cabot Cheese grader samples a 38 lb. wheel of cheddar to assess its quality at 36 months. Making cheddar cheese requires a true mix of art and science (and is a whole story in itself). Cheddar requires aging for the full flavor to develop. The natural aging process is an art that requires patience. Who are the artists? A select group of employees with the title of Cheese Grader. Enter Craig Gile, who, for the record, is not a super-taster. “If we found a supertaster, we wouldn’t hire them,” he says matter-of-factly. 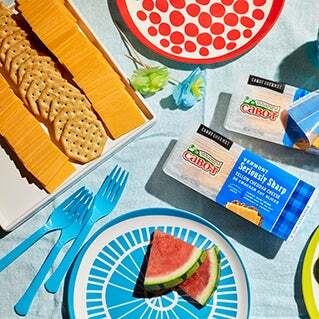 A 14-year Cabot employee who grew up on a small dairy farm in northern Vermont, Gile is now new products manager at the company and before that a master cheese grader for seven years. The job of a Cabot cheese grader is to visit all the Cabot aging houses in New England and New York to taste the cheese every few months as it ages. Equipped with a cheese trier—a half moon knife—they aim for the middle of a block of cheese and taste a sample. And like a sommelier would with wine, they spit it out. Then they assign a flavor profile to the cheese, like mild or extra sharp, adding descriptions of the cheese’s sensory characteristics for their records. The graders decide which cheeses are ready to move on to be cut — or if they need more time to age. Once a Cabot cheese is ready, the large blocks get down to the size you see on store shelves. The Cabot Creamery in Cabot, VT.
Cristin O’Donnell is a bright and cheery native Vermonter who runs the cheese cut-and-wrap process for Cabot. The aged cheese arrives from storage in big blocks and encased in wooden boxes. Though technology helps deliver the best possible cheddar to stores, Cabot employs 200 people just to cut and wrap their cheddar alone, and it has multiple production lines that run seven days a week. Each employee plays a crucial role in making sure the quality of the product is not compromised throughout the process, mirroring the effort that goes into making high quality milk on the farm. 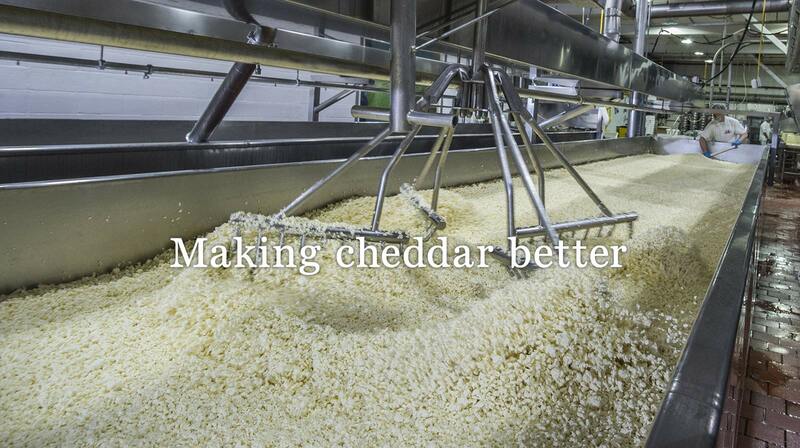 Once the larger blocks are cut to size, the cheddar is packaged, stacked and shipped to local dairy aisles. Cabot being a co-operative means when that cheese is purchased, any profit made from that sale is returned to the farm families who supplied the milk. 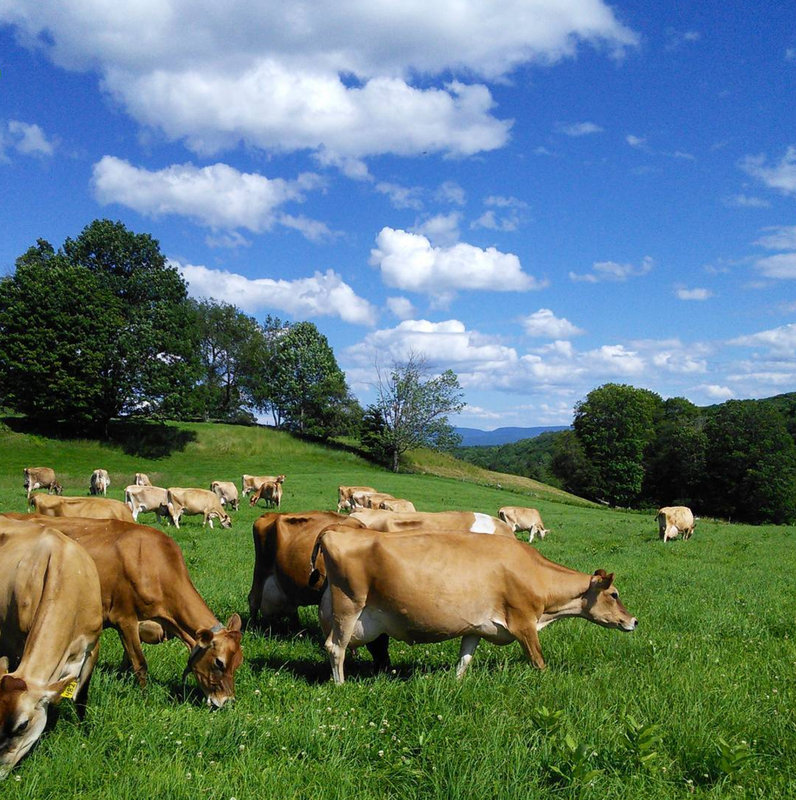 Richardson Family Farm in Hartland, VT.
Back on Richardson Farm, the cycle of making award winning cheese continues 365 days a year. They milk their cows twice a day, and that milk is hauled to a Cabot creamery each time their bulk tank is full. Those same Cabot employees, many of whom have worked there for decades, take that milk in daily and get to work crafting award-winning dairy products. On a summer day in June, two young women from California showed up at the Richardson Family Farm. They told Amy Richardson they were in the area for a friend’s wedding and visited the Cabot Annex Store to sample cheeses. They found the Richardson’s Instagram account when looking for a Cabot farm to visit. Richardson was delighted.